The Viking Star offers complete modern luxury with luxurious amenities, exciting shore excursions and exquisite dining options, passengers are sure to be more than impressed with a cruise on board. The Viking Star from Viking Ocean Cruises is a state-of-the-art ship which has all of the comforts and luxury you would expect from a top rate luxury cruise line. With 930 guests, the ship was designed to be able to directly access ports that other larger cruise ships cannot enter. On board guests can relax in the modern Scandinavian designed lounges and enjoy the surrounding nautical architecture. 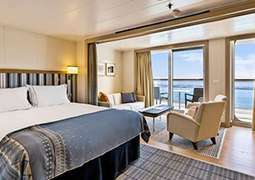 Accommodation on board the Viking Star includes 5 different options: From the Vernada class of rooms with their Viking Explorer beds and luxury lines to the full-size Explorer Suite. This suite features priority access to many onboard and shore activites along with a welcome bottle of Champagne and full king-sized bed. Dining options include the authentic Italian restaurant Manfredi’s which offers top cuisine in beautiful surroundings. Another option is the Chef’s Table which offers an enhanced dining experience that is sure to open your eyes to new dishes and wines. There is a variety of different staterooms to choose from on board the Viking Star. The Veranda and Deluxe Veranda feature a balcony and are very spacious. They have all the necessary amenities and are the standard cabins, if you feel like cruising with a little more style, Owner's Suite is perfect for you. The decor was influenced by the Viking Cruises president, it is spacious with a separate sitting area and a balcony providing spectacular views. Whichever cabin you chose, you'll feel right at home no matter where you are in the world. Viking Star offers its passengers the best cuisine, you'll be blown away by the options available. Enjoy breakfast and dinner in the main Dining Room where you will have the choice of dining with just your partner or in a more social setting - with other passengers. Be sure to try 'The Chef's Table' with its set menu, the wine hews one of five themes. The 'Manfredi's' restaurant does exquisite Italian food with an electric atmosphere! If you feel hungry by the pool, stop by the 'Pool Grill' and try one of their famous burgers. During the day there are many cafes and lounges for you to grab a coffee and a sweet treat at. On board the Viking Star the entertainment and activities are fantastic. There won't be a dull moment on your cruise holiday. The 'Star Theater' will have fascinating enrichment lectures and films during the day and grand ABBA-themed and cabaret performances in the evenings. Immerse yourself in history with the Viking Heritage Museum on board, it provides a great insight. There are a handful of board games as well as golf putting and shuffleboard to take part in if you are feeling competitive. Why not go for a morning swim and then enjoy the rest of the day by the pool and hot tub. Immerse yourself in tranquility in the 'LivNordic' Spa with a high array of treatments and a thermal suite room. Don't worry about booking it as there is access without booking and it is available to all passengers on board. If you enjoy keeping active you can spend a few hours in the fitness center or enjoy one of the classes on offer.